Rivers and Roads: what is your sunnies style? i am on the hunt for a new pair of sunnies! i want something that fits my face well and also has complete UV protection. it's funny to look back over the past few years and see how my sunnies style has changed. and y'all, it's changed drastically. in college, i wore HUGE bug eye sunglasses. not my best look. a couple of years ago, i bought my first pair of wayfarer frames (an inexpensive version, of course.) i absolutely love the way they fit and sit on my face, and i feel like they are very "me". so tell me, what is your sunnies style and where do you buy your frames? if i'm wearing my contacts thats the only time i'm wearing sunglasses - which isn't often. bleh i'm hoping to wear my contacts more though! i used to wear bug eye sunglasses...they crack me up now! Aviators! All the way! I've been wearing aviators for years. They are my favorite. I always just pick up whatever cheap pair I can find. Unfortunately, I am a breaker and a loser of sunnies...so I never allow myself to spend more than 15 dollars on one! I usually get a new pair each summer though.....and this time, I already bought them- aviators! :) Can't go wrong I don't think! 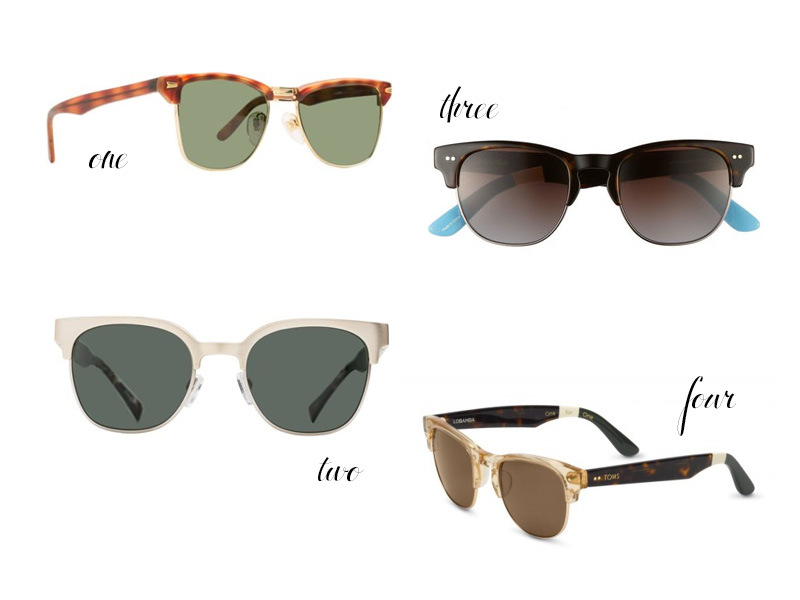 I am all about the wayfarer frames in an inexpensive version! I have 2 I got from Urban Outfitters! Love em. I wear bigger sunglasses, but mostly because smaller ones look odd on my face. I'd probably go for style 3...that's more my taste. i'm thinking number 3 might be my favorite! girl, me too. i bought a $2 pair from Forever 21 last year, but they broke a couple months ago...probably because they were only $2 ;) i will check out Urban Outfitters!! i hadn't even thought to look there! i'm with you...i've never spent over $15 either! i LOVE aviators on other people. they always look so good! i've never found a pair that looked right on my face though, which makes me sad! ooh thanks girl! i will have to check that out!